These options strategies can be great ways to invest or leverage existing positions for investors with a bearish market sentiment. For aggressive investors who have a strong feeling that a particular stock is about to move lower, long puts are an excellent low risk, high reward strategy. Rather than opening yourself to enormous risk of short selling stock, you could buy puts (the right to sell the stock). Selling naked calls is a very risky strategy which should be utilized with extreme caution. By selling calls without owning the underlying stock, you collect the option premium and hope the stock either stays steady or declines in value. If the stock increases in value this strategy has unlimited risk. For aggressive investors who expect big downward moves in already volatile stocks, backspreads are great strategies. The trade itself involves selling a put at a higher strike and buying a greater number of puts at a lower strike price. For investors who maintain a generally negative feeling about a stock, bear spreads are a nice low risk, low reward strategies. This trade involves selling a lower strike call, usually at or near the current stock price, and buying a higher strike, out-of-the-money call. For investors who maintain a generally negative feeling about a stock, bear spreads are another nice low risk, low reward strategy. 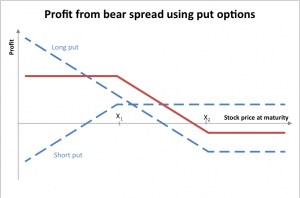 This trade involves buying a put at a higher strike and selling another put at a lower strike. 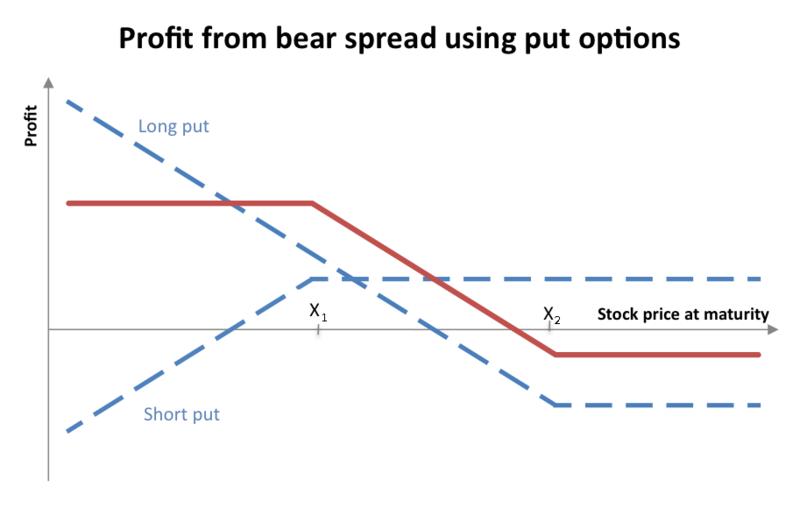 Like bear call spreads, bear put spreads profit when the price of the underlying stock decreases.